We’ve all had something hanging over our head at some point. Well, Ball-Nogues Studio has taken the term to new heights… literally. 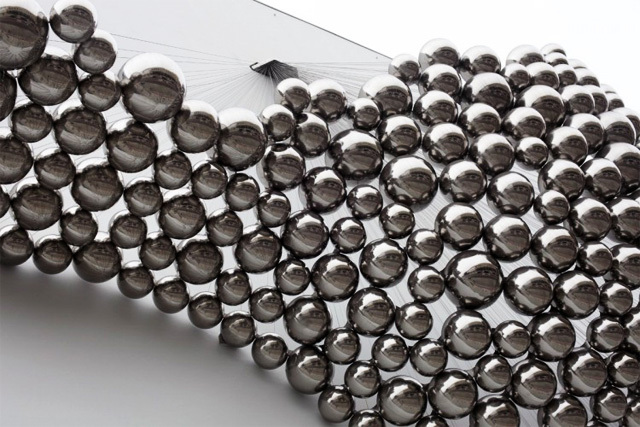 If you happen to be walking the streets of Santa Monica, you just may see Cradle, a new art instillation that features an aggregate of mirror-polished, stainless steel spheres functioning structurally as an enormous Newton’s Cradle. Cables originating from the same point on the exterior wall of a parking structure suspend all of the balls simultaneously. 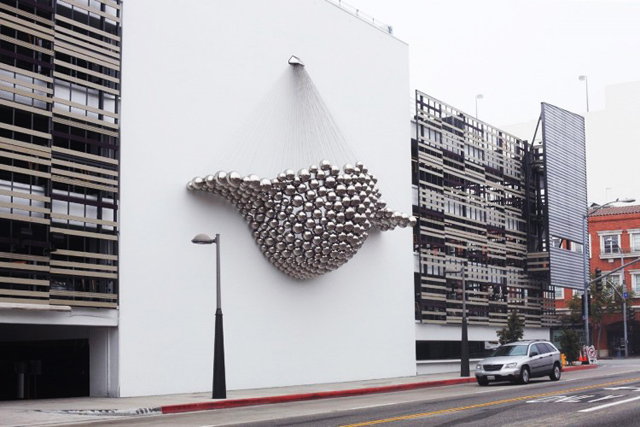 The team at Ball-Nogues Studio explains, “Aside from the Newton’s Cradle reference, we wanted the overall shape to elicit things that we thought might be slightly provocative when inserted into the glitzy Santa Monica urban landscape. James Jones, the lead fabricator on the projects explained that their fabrication process was a bit like the process of slip casting ceramics except instead of pouring ceramic slip into a mold they ‘poured’ hundreds of spheres. To their knowledge, this was the first time this technique has been used. The next time you’re ambling through the streets of Santa Monica, keep your head up, design is in the air.